Salling Software’s MediaSync is a brand new application that synchronizes playlists, music, and podcasts in iTunes onto mobile devices from Sony, Nokia and Sony Ericsson. President of the Swedish software maker, Jonas Salling, says “There are a lot of frustrated phone owners out there who love iTunes, but can’t easily get their tracks onto their non-Apple device.” His application works with iTunes 7.6.x and 7.7.x, is compatible with many popular phone models, and requires Mac OS X 10.4.11 or 10.5.x. A Windows version is also available for Windows XP SP2 and Vista with Windows Media Player 11. The basic installation is free, though the paid app features “smart” sync, allowing you to sync faster by minimizing the amount of data transferred in incremental syncs. With a compatible phone connected to a USB port, you simply select the playlists and podcasts you want on your device. 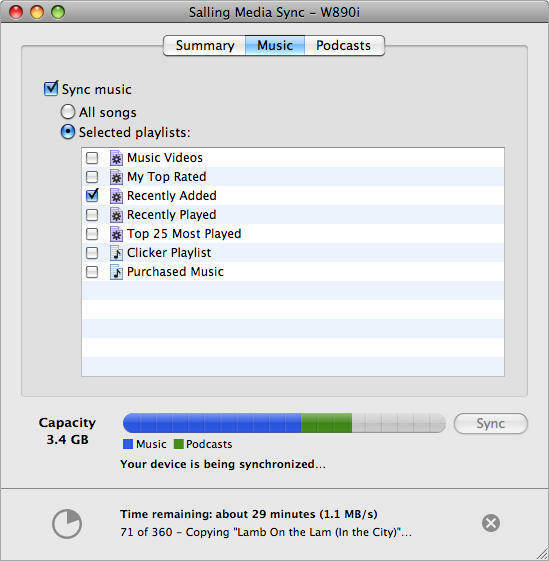 Media Sync not only uploads the music tracks and podcast episodes, but also replicates each actual playlist on your device and–on devices that support it–transfers play count metadata for each item, reinforcing the sense of having a piece of iTunes in your pocket. 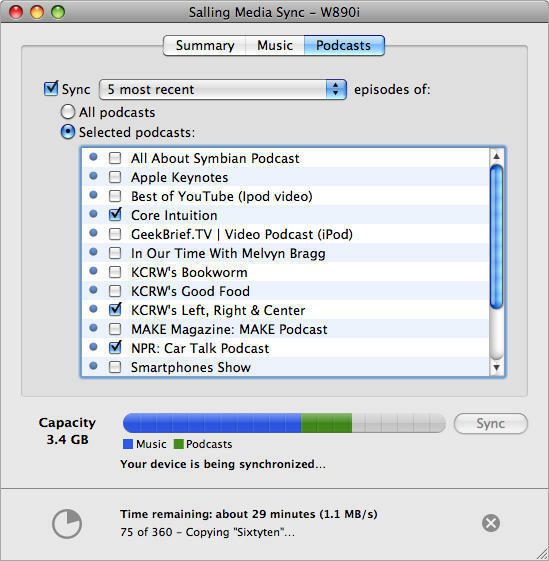 Although Media Sync works with most media in iTunes, it will not transfer DRM-protected content.